Who was John E. Mair? 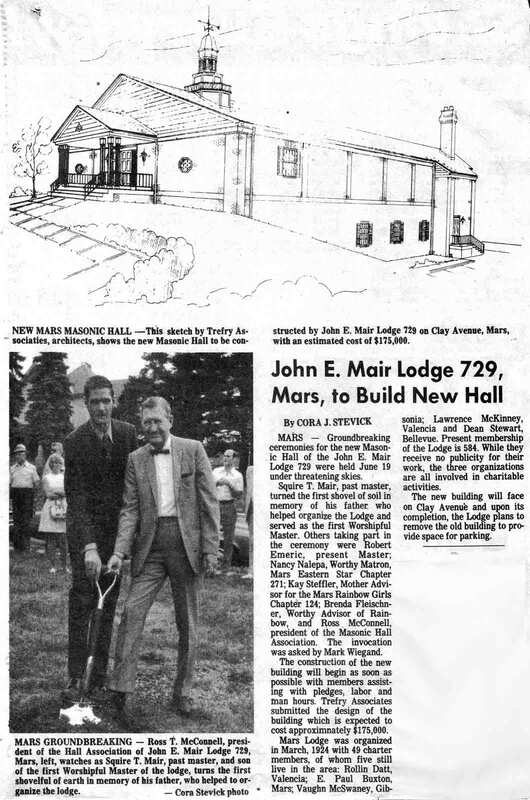 The John E. Mair Lodge was chartered in March of 1924, right here in Mars, PA by our founder and local businessman John E Mair. Mair served as the first Worshipful Master of the lodge in both 1924 and 1925. Mair was president of the Crescent Sales Company, an electrical equipment sales firm, and president of the Play Time Equipment Company. He was a Mars resident for 26 years. Mair served as Deputy Grand Master of the 54th District of Free and Accepted Masons of PA. He was also a member of the Syria Shrine, Masonic Veterans, the Pittsburgh Athletic Association and the Mars board of education. He was also active in the local Butler County Boy Scouts. 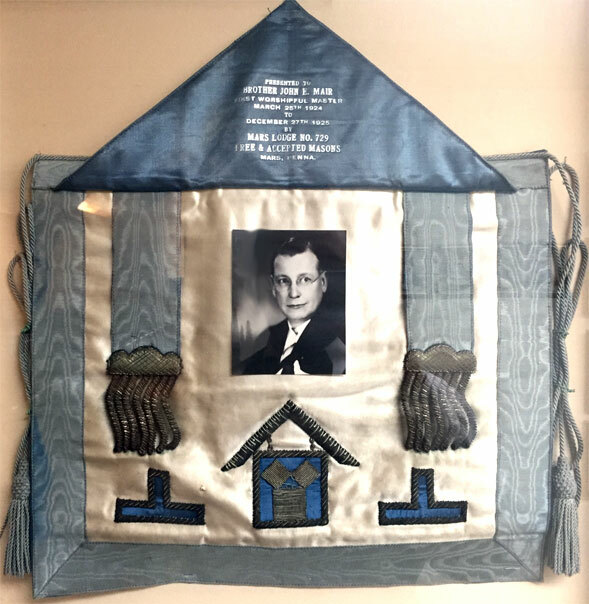 John E. Mair died in September of 1949, but his legacy as a Freemason lives on in the lodge named after him. 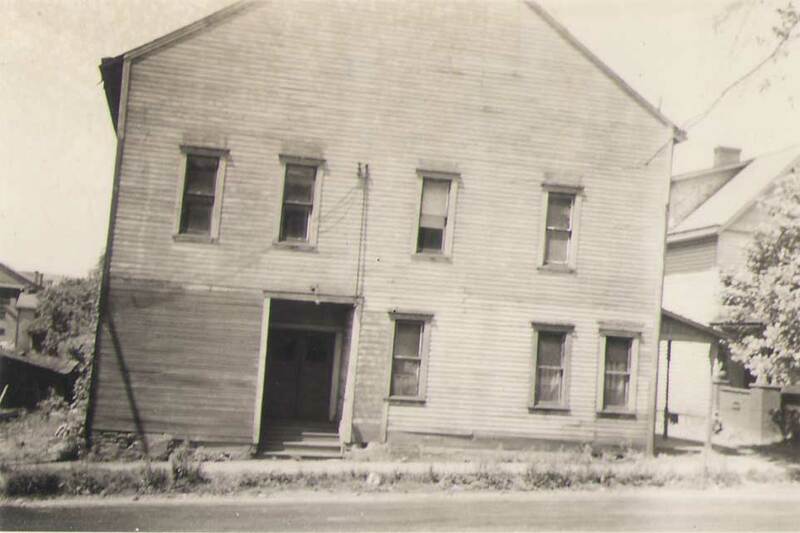 The original John E. Mair Lodge building had outlived its usefulness and had fallen into disrepair by the 1970s. Meetings with heavy crowds would cause the floor to sag. The trains which frequent the borough only a stone's throw away from the building would rattle the aging timbers. 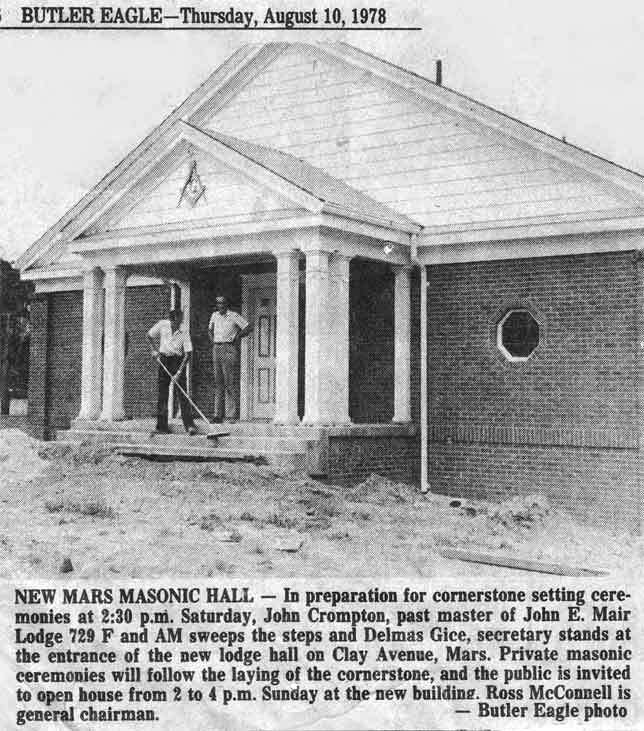 Forward thinking members of the lodge decided to undertake a new building project to create a home for Mars Freemasons well into the future. Our 2018-2019 Worshipful Master Eric did a fantastic job on creating new signage for our Lodge and installation with the help of his cousin and brother Matt. The new lettering and familiar square and compass help to let one and all recognize our place in Mars, PA. It was installed in April of 2019. 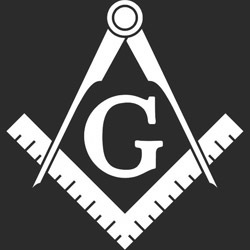 (From Wikipedia) Freemasonry or Masonry consists of fraternal organizations that trace their origins to the local fraternities of stonemasons, which from the end of the fourteenth century regulated the qualifications of stonemasons and their interaction with authorities and clients. The degrees of freemasonry retain the three grades of medieval craft guilds, those of Apprentice, Journeyman or fellow (now called Fellowcraft), and Master Mason. These are the degrees offered by Craft (or Blue Lodge) Freemasonry. Members of these organisations are known as Freemasons or Masons. The Grand Lodge of Pennsylvania has been the premier fraternal organization in PA for nearly more than 250 years. Lodges of Freemasons can be found in nearly every sizable Pennsylvania city and town. #729 is our local Masonic Lodge. (From Wikipedia) "A Masonic lodge is the basic organisational unit of Freemasonry. It is also commonly used as a term for a building in which such a unit meets. Every new lodge must be warranted or chartered by a Grand Lodge, but is subject to its direction only in enforcing the published constitution of the jurisdiction. Freemasons gather together as a Lodge to work the three basic Degrees of Entered Apprentice, Fellowcraft and Master Mason. Interested in learning more about becoming a Mason in our lodge?